Perhaps no other tiny house in the world is more iconic than the Minimotives tiny house designed by Macy Miller. Macy, an architectural designer, began construction of her tiny home in 2011, did the majority of the work herself, and created this stunner for just $11,416.16. This beautiful 196 sf tiny house rests on a gooseneck trailer and has been featured in TIME & Dwell Magazines, and countless online news agencies and websites. The spacious and modern feel in the Minimotives Tiny House creates a comfortable living space for a single person, couple, and even family with young kids. Macy, her partner James, their two children, Hazel and Miles, and their great dane Denver have created a beautiful life for themselves in Minimotives. The Minimotives tiny house design could be perfect for you if you are single, living with a partner, and/or have young children (you can build a small addition to the trailer chassis for a kids’ bedroom like Macy did). It has fared very well in cold Boise, ID winters with monthly utility costs of $50 during the coldest months and $8 per month during the other seasons. This tiny house is also an excellent candidate for an AirBnB style destination. I designed the Minimotives tiny house in 2011, and started construction before starting to date James in 2012. James didn’t run away at the idea of dating a ‘tiny house person’ and instead picked up a hammer and helped! Our home is built on top of a 24′ gooseneck trailer, yielding 196 sf. The back patio sat on a 5′ extension (dovetail) which was later turned into our children’s’ bedroom bringing the final home to 232 s.f. Our space was built for just under $13,000 (including the addition, original total was $11,416) including lots of reclaimed materials from our shipping pallet siding to new but reclaimed windows. My goal was to create a light, open, and effective home. It has functioned as a testing ground for lots of ‘green technologies’ like a composting toilet and radiant heat floor. Indeed, this space has been a powerful part of my life in the recent years, and it continues to inspire me to live a life of adventure and family. As you enter the Minimotives tiny house, you’ll feel welcomed by the living area which comfortably seats three. A book shelf provides plenty of space for your favorite titles and could also house your TV. Drawers below the book case create additional storage space for your special items. A working desk in the living area can serve as your home office, eating table, or craft space. Towards the front of the tiny house is the bedroom which is built over the gooseneck portion of the trailer. A set of steps lead to the queen sized bed and doubles as storage space for clothing, etc. Headroom above the mattress is very comfortable, allowing one to sit up comfortably. Below the mattress is the closet with two cabinets for hanging clothes in and five drawers. The kitchen is galley style which creates a very functional space for those that love to cook. A four burner stovetop and oven are large enough for family style cooking and a deep double-sink make tiny house clean up a cinch. There is an abundance of counter space, cabinets, and drawers for all your kitchen gadgets, pots, and small appliances. A pantry provides loads of space for your dry storage goods, while a nice sized refrigerator holds enough fresh items for a family. There’s even space for a microwave above the fridge! Storage for plates, glasses, and pots is open which helps the kitchen feel spacious and elegant. A washer/dryer combo space is also available if you prefer to do your laundry in the home. The bathroom is compact and functional and contains a composting toilet (if you choose to use one), a small sink with storage cabinet below, and a lovely shower. If additional room is needed to create a bedroom for one or two children (or some other use) you can close in the porch for an extra 36 sf of usable space. In Minimotives, that space was converted into a bunk bed room for Macy and her partner James’ two children. There is enough space in there for storage for all of the kids’ clothes as well as their toys. 33 page set of drawings that includes general information (including links to products that may be less familiar and my exact fixtures), a material list for basic costing purposes, some floor and ceiling plans, elevations and framing plans, as well as the electrical plan, plumbing plan, millwork and all the details of assemblies used in the house. PLUS, REMEMBER YOUR $200+ IN FREE BONUSES! Version one (2011) was 196 s.f. with an additional 5’x8′ patio. Version two (2015) is 232 s.f. 18 months to move in, another 6 months to finish after occupancy. Version one was $11,416.16. The renovation/addition was an additional $2,227.15 for a grand total of $13, 643.31. The home is occupied by myself, my partner, James, our daughter, Hazel, our son, Miles, and our dog Denver. Did you hire a crew to help or did you and a few friends do it? It was important to me that my hands were involved in every step of the process, I did the majority of the work myself but did have friends help when I needed extra hands as well as having professionals check my plumbing and electrical after I completed it to assure it was correct and not a life safety hazard. How long has it been finished is it holding up well? I moved in full time June 2013, it has held up very well. What are you using for heat and A/C? I did not have an A/C the first year and instead used passive cooling strategies (night flush cooling, ceiling fan, etc.). After my daughter was born I did get a window A/C unit for her safety, we have summers up to 110+ degrees and I did not want to be stuck in a situation where we were at risk for heat problems since babies are more susceptible. We don’t often use the A/C but it is there if we need it. I have used several things to heat, at first it was radiant electric heat, I have since removed that as I found it to be less efficient rather than more. While heating isn’t generally an issue I have used an Envi Convection heater (worked well but wasn’t quite enough below about 30 degrees), a propane heater (great and fast boost), and an electric radiant heater (worked well but not fast if you are starting at ‘cold’). We do have winters in the negative digits so I have redundant systems to heat as to not get stuck in a hazardous situation. Where do you think you cut the most cost? Definitely on the shell, I was able to contact local projects and get very inexpensive materials. What was the most expensive? The toilet. Sun-Mar Centrix 2000 electric. It was $2,000 of the original $12,000 dollar budget. Would you have changed anything if you could redo it? I would not use dark flooring, it shows dirt too easily. I would have used 3/4″ plywood for cabinet doors, the 3/8″ has warped over time. I rent an empty lot in Boise, Idaho for $200 a month plus utilities. How did you find the land? I found land by networking but you can also use Craigslist (parking section). Utilities (gas, electric and water) range from about $8.00 a month in summer to about $50.00 in winter. I get water via the host house and a potable water hose. How do you get power? I get power via the host house on a dedicated 20 amp circuit via a standard 15 amp power cord. What was the transition into tiny living like for you? It was not difficult for me, I am a pretty minimalistic person, I was excited to sell all my junk and be free of the burdens that seem to accumulate over time. The transition has felt very natural for me personally. How did you come up with your design? What were the most important aspects for you to include? My design was driven largely by budget, weight and aesthetics. The trailer is weighted appropriately for both the trailer size and towing capabilities. I had set a budget of one years worth of rent payments to build the home. Around that I tried to make it as ‘pretty’ as possible. In order to get a good starting point I made a list of my 10 most important priorities to have in the house (things like a full oven, and over sized shower, room for two adults and a great dane, reusing my king size mattress, etc. ), made some paper cut-outs and started rearranging things until it felt right. How did you choose your appliances and building materials? My building materials were largely decided around my budget and figuring out how to make that work, some things, like my tile floor for my radiant heat system could not be had second hand, I made up for those in the budget by using non-standard but cheap materials elsewhere, like my siding of reclaimed shipping pallets that were free. I also had to balance weight in those decisions, knowing I had a very heavy floor drove me to make decisions on lighter materials elsewhere, like a TPO roof rather than steel for example. The appliances we chosen off of my needs for the house, all were purchased new. What has the most surprising part of day-to-day life in a tiny house been for you? I have to know… how do you live with a Great Dane in 196 square feet?? Great Danes are very lazy animals, the hardest part of Denver’s day is deciding whether to lay on his bed, my bed, or the couch, all of which are out of the way for most purposes. He does really well in the tiny house, we do force him out and about to dog parks and play dates with other dogs but even that takes some talking to (he doesn’t do anything he doesn’t want to do and at 150# I can’t ‘make’ him… ). There are dogs from my past who I would never make live in a tiny house, they have too much energy for it, Denver is perfectly suited for it. Why did you decide to build? I was initially studying for my Architectural Registration Exams (A.R.E.s) when I realized that all the schooling I went through taught me nearly nothing about actually constructing something. It taught all sorts of design but without that integral part of constructing I don’t feel I can be as successful at my career as I would be WITH that skill. This build was an attempt to teach myself how to build things, and an opportunity to test out some sustainable features in a real life scenario AND, I don’t like paying rent or the idea of going into hundreds of thousands of dollars of debt to a bank. Have you run into any problems with your local codes? How did you solve them? I have not yet, I fully intend on running into code issues and disputing them… I want to maintain an urban lifestyle with my house. What is/was the most time consuming portion of your build? I was using recycled pallets for siding, in order to do this I had to disassemble the pallets, plain them down, cut them to vertical size and then measure each one to cut it to horizontal size. What sort of items do you have for cooking? I will have a recycled, 4-burner, small oven 100% gas stove from an old camper and a microwave, as well as a BBQ on my patio :). Do you have a washer and/or dryer? Yes, I have a combined washer and dryer unit in my kitchen. I have a plain old hose hook-up with a POTABLE water hose which runs through a filtration system and an on-demand, propane water heater system to my two sinks (kitchen and bathroom) as well as my shower. What are some of the space savings tricks you used? I have incorporated every single ‘dead space’ as storage. The steps leading to my bed are shelves, the space above my pantry is sunken to have storage, behind my fridge is more storage, I have built-in book shelves and I have plenty of cupboards and space under my bed for storage. I have opted to leave open shelving in the kitchen to make it feel ‘bigger’ and more open but will be using shelving that maximizes the amount of storage space available. What do you have for insulation? I used 4″ of rigid, closed cell insulation in the walls and ceiling adding up to an R-20 in those assemblies. The floor has 6″ plus a radiant barrier and an airspace, adding up to an R-42 in that assembly. Is there anything else you would want other people to know about your house and build? 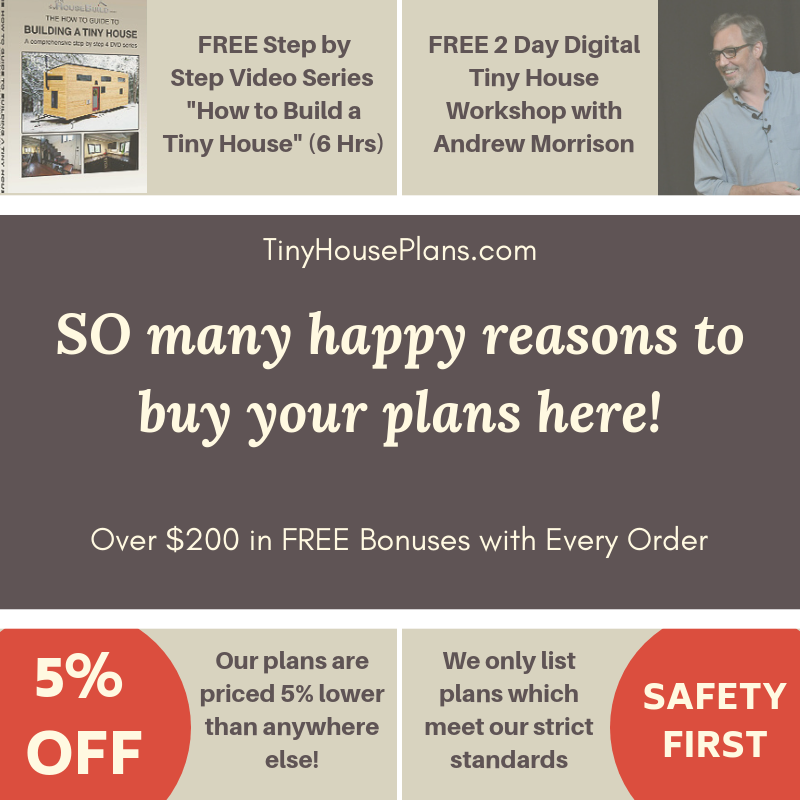 I have really tried to push the boundaries of how a tiny house can look/be, I have incorporated a rain-screen wall system, TPO Roofing system, radiant barrier, and even a green roof system – without all the weight. I have fallen in love with the entire tiny house concept and will definitely be using this amazing adventure in my future life endeavors. 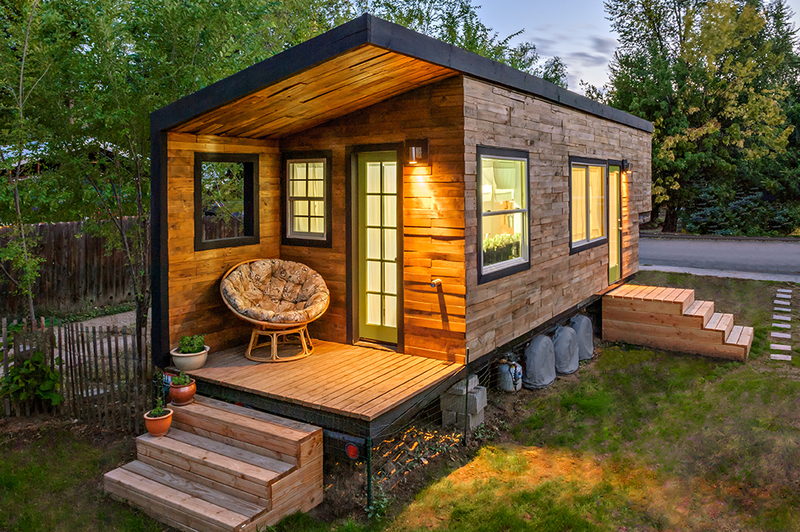 What made you decide on a Tiny House? I have never really been a collector of things, I had gone through a divorce and had a house full of objects that filled rooms but lost the house. It was painful to sell everything my ex husband and I had collected (for pennies on the dollar mostly) but once it was all gone I felt so free. The realization of being happier with less was a surprise and I wanted to run with it. My goal was to create a space I could learn from first (I wanted a project to actually build something, it had to be big enough to incorporate electrical and plumbing, I was studying for my architectural licensing exams). I helped justify the expense by making it a ‘challenge’ that I would also live in it. I set the budget at one years worth of rent payments and decided to live in it for two years, that way it would pay for itself and then some in savings. I also wanted a home of my own but was not ready to take out another mortgage, I hated that emotional weight. So there were a lot of factors that pointed me in the direction, they all contributed to kicking me off on the journey. How big was your house you lived in before you built your Tiny House? I had a few rentals after my large home and before my tiny house. The home I had while married was 2,500 s.f. I then lived in an 1,100 s.f. Apartment, then a 650s.f. Then down to 450 s.f., it was a gradual progression down and each place seemed way too big still at the time. It seemed like I maybe only used half of the space and sometimes it was just to hold things I never used or liked anyway. What are your views on minimalism? I am a minimalist. It’s not something I try to be, it’s just something I am naturally. I have never enjoyed holding onto things for ‘sentimental value’. The value to me has always been in the experience and the memory, not in the object. I think everyone should live their own ‘happy’. Minimalism is not mandatory but I think being intentional about life should be. I felt a lot of pressure to get bigger things, have more stuff as a way to be ‘more successful’, I played into it, and I found out the hard way that that’s a crock, at least for me… I’ve found a lot of peace and joy in less. I feel like the things in my life either hold value or they don’t, and then they don’t get to take up mental or physical space. Some people can’t or shouldn’t be minimalists, we all should do what is right for us and celebrate others’ version of right too. For those that want it all detailed out down to the millwork the ‘Full-Plans‘ set has just that. It’s a 33 page set of drawings that includes general information (including links to products that may be less familiar and my exact fixtures), a material list for basic costing purposes, some floor and ceiling plans, elevations and framing plans, as well as the electrical plan, plumbing plan, millwork and all the details of assemblies used in the house.